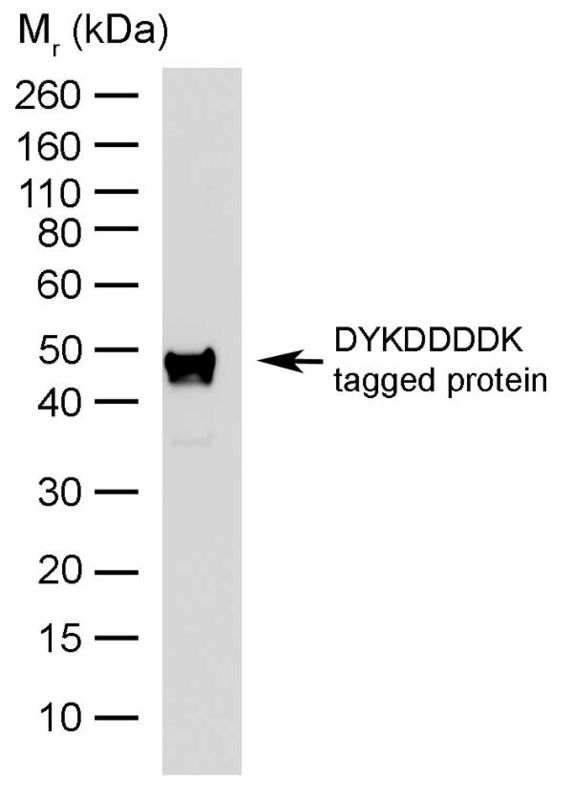 DYKDDDDK tagged protein probed with Rat anti DYKDDDDK tag:HRP (MCA4764P). Rat anti DYKDDDDK Tag antibody, clone 6F7 recognizes the hydrophilic epitope tagging octapeptide sequence DYKDDDDK (Asp-Tyr-Lys-Asp-Asp-Asp-Asp-Lys), when fused to either the amino- or carboxyl- terminus or at an internal site on target proteins. Rat anti DYKDDDDK Tag antibody, clone 6F7 works at neutral pH and has very low background staining in immunocytochemistry.